Trees pass through many stages as they grow. If a tree starts its life as a seed, it will initially grow a short stem. Most of its energy will be used to continue the growing process. Young trees are typically small and thin. During this early period they are also vulnerable. Both seedlings and transplant trees will not only need space to grow but also protection from the environment. Tree growth will be centered around the root system and canopy. Branches will become long and slender. Very little pruning is needed during this period. Once a tree has become established, it will grow at a fast pace. The tree will have an increased ability to defend itself against pests, illness and disease. A good branch structure can be created during this period with pruning. Saplings are trees that have reached several feet in height and whose growth process has started to slow down. Most saplings have a trunk that is a foot or less in diameter. Saplings will often look like mature trees in size, without being able to reproduce. When a tree reaches maturity, branches will be strong with abundant foliage and the tree can reproduce. Tree limbs will continue to grow, but at a slower rate. This is the time when a tree is at its strongest. 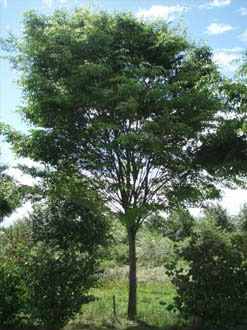 Mature trees can be thinned to maintain the tree’s health and appearance. During the later stages of maturity, many older trees will develop flat-topped canopies. Major limbs may also start to die and the tree’s energy resources will decline. The trees ability to produce seeds will also reduce. Pruning dead limbs from an older tree will help maintain its health. Consider the health of the tree before pruning. Older trees cannot recover from over-pruning like younger trees. Pruning an older tree also makes it more susceptible to insects and disease. Tree nurserys have arborists that can give you advice on the best care for your type of tree. During the end stages of a tree’s life (also called senescence) more limbs die and break. The tree will also lose its ability to ward off pests and disease. The trunks of senescent trees will typically become hollow. Eventually, the tree may fall. Senescent trees that die and remain standing are called deadwood. There are many factors that determine how long a tree will live, including the overall health of the tree, environmental factors and maintenance. The size of a tree depends on the species. Trees like the Western white pine, a timber tree, can grow up to 160 feet tall. White bark pines will reach 40 feet tall. The Sitka spruce can grow as tall as 140 feet. A Douglas fir can reach heights of up to 200 feet. Dead trees should be removed by a certified arborist. Falling branches or limbs can cause injuries and damage power lines, as well as property. A big tree specialist who is expert in big tree moving will have the equipment that is needed to remove a dead tree before it falls. Someone with experience will also know the best way to remove the tree from your property.